and some kigo are related to it. In Japan, official prayers at shrines or temples are often accompanied by ritual dance and other ceremonies. This refers to a ceremony in Tohoku, Northern Japan, where the yamabushi priests dance a special dance, Yamabushi Kagura 山伏神楽 with two people carrying a lion head. aogitoo 青祈祷 (あおぎとう) "prayer in the green season"
Ceremony on the day of the ox in the sixth monthe of the lunar calendar. A prayer wand is swished over the green fields, praying to Inari, the deity of good harvest and prayers for a bountiful harvest are spoken by a priest walking through the fields.
. Rice planting and kigo . with the beginning of advent (which is not well known in Japan) we are now in a time where the thoughts revolve around our faith. I would like to argue that each haiku conceived in the right moment is in itself a "short prayer". It might not get you into the top ten of a haiku competition, though. Reading the haiku of Issa is a great learning experience for writing haiku about faith. Meditation is another word used. 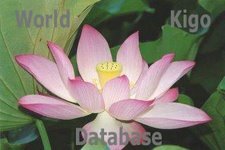 We have God, Christmas and Church and many more in the World Kigo Database. Memorial Days of saints and religious figures are often used as kigo. I would like to invite you to a discussion about this theme, any faith is welcome, it should not be a discussion about any particular FAITH (or which one is right and wrong, we can not decide that here) but how to express your feelings about it in haiku. Maybe a little inter-confessional disucssion. Contact me privately if you want to contribute without giving your full name. I happen to be a buddhist so I may not have a different perspective to add. I believe that interbeing as defined by Thich Nhat Hahn especially is the core of the buddhist faith and that interbeing involves the relatedness of all. This then leads to a natural expression in haiku, for haiku are all about relatedness. It seems that the tiniest things have the stuff of miracles. And haiku are uniquely equipped to express that wonder and reverence. > ... see whether a church (one you know or one you do not know) is open when there are NO services (on a week-day). Just go inside, and keep quiet. Maybe have a seat and say a little prayer on your own. Sit and look around you. Or get up and walk around quietly, looking at the church. Do not talk, unless someone greets you. > See some of the details of the building. Are there any insects about? Is there a particular smell? Any flowers? Be aware of the small things in the church, and remain conscious of the atmosphere. 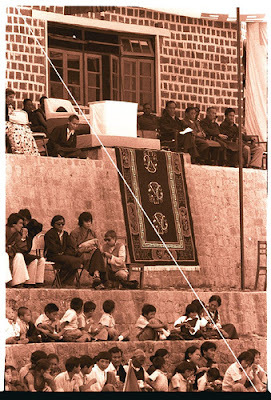 An atmosphere of prayer? Of faith? What does the stillness on a quiet day in church tell you? Focus on what you see, hear, touch, smell. And write about it when it has spoken to you! These haiku remain at the level of the observation and, to my mind, do not necessarily speak of faith. me. It would be my delight if some of these sketches came to contain a deeper meaning that allowed the reader a glimpse of my faith. Glad to have this discussion! 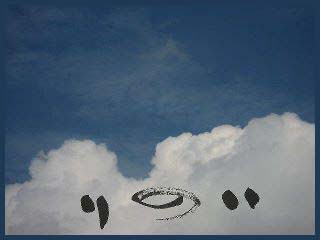 It would be great to read how others write haiku expressing their faith. Thank you, Gabi, for a beautiful reflection on faith and haiku. > I would like to argue that each haiku conceived in the right moment is in itself a "short prayer". I would agree... right moment and right spirit... What you say, makes huge sense to me. > Haiku should be haiku-like (whatever that is ... grin ). > That does not exclude writing directly about our religious experience in a special moment, if there was one. Yes, agree here too. What all this means, is perhaps for us to find out! Chibi san, thank you for your thoughtful remarks too. > the culture... these can/may be granted diety power and knowlege. My reaction would be that the tree, ocean, rock, and mountain you mention probably do not HAVE faith, but they can be OBJECTS of faith, i.e. people (or animals?) can have faith in them. Perhaps at the moment I see fewer layers of meaning in the word FAITH. Faith, to me, is a belief and a trust. The same sentiment is there at heart when one talks about one's religious faith ("I have faith in God"), the faith one has in another human ("I have great faith in my partner as a sound judge of human character"), or the faith one has in a concept ("I have great faith in the human survival instinct, which will get us out of this tricky situation"). > through the culturals' filter(s) learned-embued by/to an individual. > context) and have FAITH that the best HAIKU enters the empty heart. > empty heart. Either way, requires first the heart to be empty. coloured by the fulness of the heart. And this perception, coloured by the heart, can lead to beautiful haiku. > then, that is beyond my perview to pontificate. The trappings ARE not faith, but they can be an aid to people in their faith. Many objects can do this -- old well-thumbed Bibles, the gestures of a priest at a Holy Communion service, church music, sacred dance, candles, as well as so many other things in many cultures and religions. In Kenya, certain trees are associated with worship. They grow wide and old, and are always held in awe, even now in this era of Christianity. The colonialists cut them down and built churches in their place -- and many are the stories of the church buildings which brought sorrow and grief to the communities around them... earthquakes, floods, or even collapsing for no apparent reason. The tree IS not faith, but it helps people in their faith. The cathedral where I work in Nairobi, when planning new buildings, designed the whole complex around one of those old sacred trees, which now holds a place of honour in the Cathedral compound. Wishing you many beautiful haiku, this Advent! Chibi has brought the notion of an empty/full heart into the discussion. 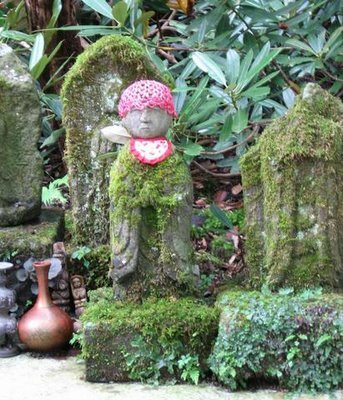 A Japanese baby is taken to the Shinto shrine for its first "Visit to the divine", a couple is married with a "Christian" touch in a chapel (no need to be a real Christian to get this "service") and the last way leads to a Buddhist cemetery. I think religion in all its cultural varieties caters to the needs of humans in diverse societies, whereas my faith expresses my personal dealings with the divine or the non-divine, if I include atheism, marxism etc. here too. I have always wondered about my "Buddhist" friends living in Christian Germany. a prayer is something that always rises !! mmm, how about a prayer to mother earth? or to the god of the ocean? © Gabi Greve, LOOK HERE ! Kobayashi Issa about not saying your prayers . . . This hokku is Issa's only hokku written on 6/2/1806, a day after the biggest festival of the year for believers in Fuji-kou (富士講), a popular religion in the Edo area in Issa's time based . . .
. fujikoo　富士講 Fujiko in Edo . It seems that it was Issa himself rather than the town in question who didn't pray. ... what Issa was going to pray the day after was at a tomb stone of a lady he loved long time ago. Her name is inscribed as 「香誉夏月明寿信女」. The tomb is at temple Senpuku-Ji 専福寺 and the lady in question was probably O-HISA san おひさ, who died too early and left Issa at age 20, finding him now, at age 44, back at her grave. The temple had been founded in 1504 by 槃誉久悦 to pray to Amida Nyorai, the Buddha of the Pure Land. The haiku by Issa was probably written while he stayed at Urga 浦賀. Guyana is experience a periodical weather condition called El Nino and the local sun is unusually hot. However I still have to do my meditation sometimes in the afternoon when I am free. I understand that "sitting" mentioned in the early japanese haiku means meditation mostly. I would like to tap into these "sitting" haiku. I think of it as a silent prayer without desire for anything . ***** . Lingam worship in India . The Dalai Lama once admitted, when questioned regarding his daily spiritual practices..
"Each day, more and more, I try to face up to the world as it is." Who needs a better yoga than this? None of these contain the word "faith," but I think it's present in them as a theme. ... how could I not see? I actually prefer the word meditation as opposed to prayer, which is more often associated with supplication or asking for a favour. Meditation gives me more room to see things as they are, and takes away the selfishness of wishing they were something else. That is not to say, of course, that change is not good, change also being something that is, and to close one's eyes to it would be fatal. Quite a heavy topic, this one, Gabi. And yet we spend not enough time on it.